Opportunity in the NFL usually translates into fantasy football success. The top wide receiver on a team will naturally see the most targets, making him more valuable to own in your fantasy league. 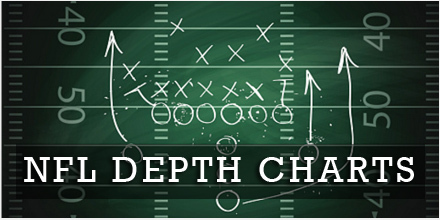 However, it’s important to not to overanalyze NFL Depth Charts as things do change. The workload distribution between the running backs in Miami is a lot different than it is in Pittsburgh. Be careful you don’t naturally assume that a player in a starting role will gain you a lot of carries or see a lot of targets just because their name is first on the list. This can also be said for Tight Ends. Some coaches have their offense set up for a pass-catching tight end to make a lot of big plays or will be heavily targeted in the red zone, others prefer a guy that is just great at blocking. Having a better understanding of the offense usually helps when looking at the depth of the team. NFL Depth Charts can be helpful in deep fantasy leagues if you’re trying to find sleepers for late-round stashes that could emerge later into the season or in the future. It helps to know where a rookie is slotted and if he has the chance of stealing a job mid-season. At the same time, you should not get discouraged if you see a player listed as a wide receiver three, as this could mean he is projected to start in the slot position. Depending on the quarterback, or scheme, a wide receiver in the slot could thrive in the reception category. A great example of this was Nelson Agholor from the Philadelphia Eagles last year. After two tough seasons in the NFL, the coaching staff moved Agholor to the slot. The third-year wide receiver went from 32 receptions in 2016, to 62 receptions in 2017. He thrived in the position change despite many fantasy owners avoided him in fantasy drafts due to the addition of Alshon Jeffery and Torrey Smith. Another example of how NFL Depth Charts can mess with your draft strategy is trying to figure out the New England Patriots. Bill Belichick is notorious for providing as little information as possible to the media and has been quoted a number of times as saying depth charts are meaningless. His gameplan often changes week to week with players having larger roles based on the offensive scheme the team chooses to implement against that opponent. The Tight End position drops off quickly. While adding one of the leagues top pass-catching Tight Ends can really boost your team’s fantasy football output, the league has only a limited supply of quality players at this position. In 2017, there were on five TE’s that averaged seven fantasy points or more last season and only eight players that had more than 600 yards. Meaning, if you find yourself halfway through your draft without a tight end, don’t panic, the quality from the middle of the pack to the bottom is all the same. Your best strategy is to take one late and stream them all season long. **Refresh page if the table is empty.